Popular tarot artist Lynyrd-Jym Narciso has focused his creative talents on modernizing Marseilles Tarot. 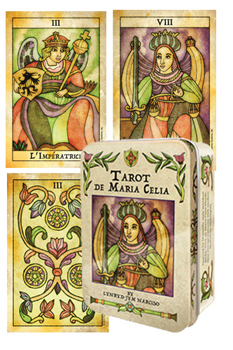 Tarot de Maria Celia was inspired by several variants of the traditional Marseilles style yet brings its own uniquely charming features to this new deck. The card illustrations feature a fresh pastel color palette with "faux vintage" accents. In keeping with the European tradition, the card titles are presented in French. Lynyrd-Jym Narciso is an artist, illustrator, and graphic designer based in the Philippines. He has been creating tarot decks for over a decade. The main influence and inspiration for his art is the Taxonomy of Art itself - how styles and periods differ from one another, hence the varying looks of his decks. This pocket sized 80-card deck in a tin comes with a 56-page instruction booklet.